Biopic films are naturally an attractive proposition for moviemakers looking for a fairly easy story that will grab public attention based on what it is about, with this year’s numerous releases, including upcoming ones, showing that the trend is far from worn out. 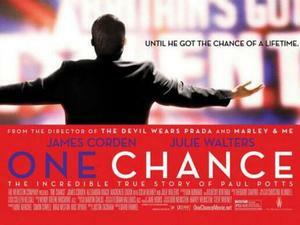 One of those films is One Chance, a comedy-drama from The Weinstein Company and Syco Entertainment scheduled for a 25 October release in the UK (with an official premiere at the Toronto International Film Festival next Monday (9 September)), and starring comedian James Corden (Gavin & Stacey) in the lead role as the life story of opera singer Paul Potts is retold. Potts is known for shooting to fame as the first-ever winner of ITV reality show Britain’s Got Talent in 2007, with the cinematic interpretation (directed by David Frankel (Devil Wears Prada)) set to delve a little deeper into the story behind that audition than the program showed. For this, the movie will feature Julie Walters (Harry Potter) and Colm Meaney (Star Trek: The Next Generation, The Damned United) as the singer’s parents, whilst Alexandra Roach, Jemima Rooper, and Mackenzie Crook also feature, along with ‘as themselves’ appearances from Britain’s Got Talent judges Simon Cowell and Amanda Holden. In other news, a more recent celebrity generated by Britain’s Got Talent will soon feature in a film of their own, although the star will not be sitting out on their portrayal, whilst their actions will also have very little connections to real events. Beginning development earlier this month, Pudsey: The Movie is to be designed as a live-action family adventure from Vertigo Films, ROAR Global, and Syco Entertainment, with the titular dancing dog (from series 6 winning act ‘Ashleigh & Pudsey’) taking part in a fictitious plot and being ‘voiced’ by show judge David Walliams, with the title set for a release in ‘May 2014′.